Saturday's marquee matchup saw No. 19 Texas upset the Big 12 applecart by outscoring No. 7 Oklahoma 48-45 after a game filled with plenty of thrill and spills — and chills. WASHINGTON — Saturday’s marquee matchup saw No. 19 Texas upset the Big 12 applecart by outscoring No. 7 Oklahoma 48-45 after a game filled with plenty of thrill and spills — and chills. The notoriously slow-starting Longhorns jumped out to a 24-10 second quarter lead and led 45-24 after three periods before the Sooners stormed back to tie things up with under three minutes left. But Kyler Murray and company left too much time on the clock and Texas was able to kick a field goal with nine seconds left. 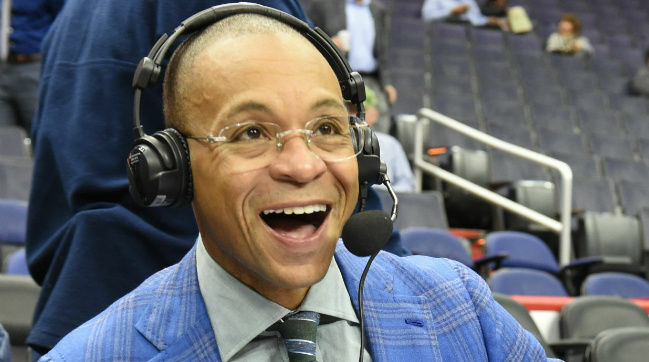 Calling this roller coaster ride next to the Texas State Fair was FOX’s Gus Johnson, an announcer known for high-energy calls of big plays in clutch situations. He might not be everybody’s cup of tea — or, more appropriately given his energy, double espresso — but nobody makes the mundane plays more interesting and nobody makes the big plays more sublime. Maryland (3-2, 1-1 Big Ten) in its 42-21 loss to Michigan scored more points against the Wolverines than they had in the last three years combined, but the Terps were unable to contain the Wolverines after holding them in check for the first quarter. Terrapin Triumphs: Tyrrell Pigrome came off the bench to lead the team with 63 rushing yards, including a 42 yard scamper and the game’s final touchdown. Tre Watson tallied 10 tackles to pace the defense. Ty Johnson returned a kickoff 98 yards for the touchdown that gave the Terps their only lead of the day. Terrapin Troubles: The offense stalled early and often, gaining just 47 yards in the first half. The defense allowed the Wolverines to move the chains on nine-of-13 third downs … as Michigan scored five of the last six times they had the ball (the final possession of the day being the exception). Penalties continue to be a problem, with 12 flags for 107 yards. Next: Saturday at home against 1-5 Rutgers (noon kickoff). Navy (2-3) went west to face Air Force, and things went south after the Midshipmen took an early 7-0 lead. The 35-7 loss was their biggest defeat in the series since 2002 (Paul Johnson’s first year). Midshipman Medals: Not a lot of good to thumb through. Pete Tanuvasa made 11 tackles to pace the defense. Owen White averaged 48.7 yards per punt … and he had plenty of practice with a career-high seven punts. Midshipman Miscues: The offense went three and out five times in seven first half possessions … and converted just 2 of 13 third downs. Navy quarterbacks completed 3 of 12 passes. Next: Saturday at home against 3-3 Temple (3:30 p.m. kickoff). No. 24 Virginia Tech (3-2) held Notre Dame to minus-three rushing yards in the first half, but on the Fighting Irish’s second offensive play of the second half Dexter Williams broke for a 97-yard touchdown that turned a one-point game at intermission into a 45-23 rout. Hokie Highlights: Ryan Willis threw for 309 yards while Damon Hazelton tallied 12 catches for 131 yards and a touchdown. Reggie Floyd recorded seven tackles and an interception. Hokie Humblings: Two turnovers, one of which was returned for a Notre Dame touchdown. The defense gave up big plays — in addition to the 97-yard TD, the secondary coughed up passes of 40 and 56 yards. Next: Saturday at 1-3 North Carolina (7 p.m. gametime).